As we continue to build up to some of the world's biggest and most competitive high school track invitationals, we wanted to look at the distance relays one more time. This is an exciting time of the year for strong distance squads (and also for fans of distance running): the intensity of these races is very high, and it's a departure from the normal individual routine for distance runners that don't get to contribute to team events in the actual championship season. 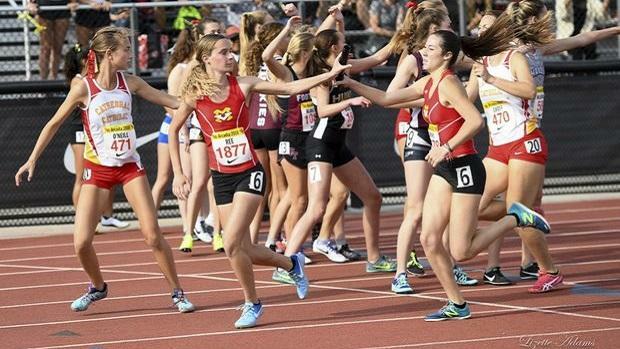 We've used our XC Team Scores feature to generate 4-person team 800, 1600, and 3200 reports, with the first two having obvious value for predicting the likely top teams in the 4x800 and 4x1600 relays we will see over the next few days. We have another purpose for today's stats extravaganza: we often use team results in the 1600 and 3200 to measure the "off season" progress of cross country teams. It turns out that having depth and quality in those events during the spring is highly correlated with success in the fall (and can also be predictive of individual breakouts, but that's the subject of another article). The last two slides focus on returning talent only (no graduating seniors), measuring 5-deep to see which teams have put a big emphasis on the kind of year-round development that is a characteristic of the best cross country programs.